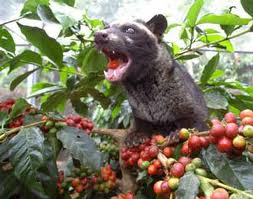 'Mongoose coffee' is coffee tree ripe fruit are eaten by the mongoose (a type of weasel), later published as 'excrement mongoose' but beans are not digested so it is still in the form of coffee beans. So in the stomach 'beans' undergo a process of fermentation and removed again in the form of seeds along with the 'dirt weasels'. Next the beans are cleaned and processed like regular coffee. "Mongoose Coffee" is one attempt to increase the added value of coffee, in addition to regular coffee as 'coffee Arabica' normal (Java coffee) and 'Robusta coffee' normal. that distinguishes 'Mongoose coffee' with 'coffee beans' ordinary eaten by Mongoose and issued in the form of 'coffee beans', so the more fragrant aroma and no bitter taste bitter and sour more typical and special. 'Mongoose coffee' is the most expensive type of coffee beans in the world, so to get into the Guinness Book of Records. Mongoose coffee prices last 4 years in the international market increases, even at U.S. $ 500/kg of dry beans (moisture content 11.5%). Compare the price of 'regular coffee' a number of qualities that only U.S. $ 4.5 / kg. Notoriety 'Mongoose coffee' has been known to go abroad, even outside the country, there is a cafe that sells 'Mongoose coffee' with an expensive price. Long, long 'Mongoose coffee' Dutch colonial is the top market position, both in terms of taste and price. However, because the first product quality has not been maintained continuously, even at the highest price can not be raised higher. The main cause, 'Mongoose coffee' 100% is still dependent on nature. Coffee Studies are still ongoing. This was considered necessary because the coffee was still save a lot of benefits that have not been exposed. For those of you who enjoy coffee, here are some benefits of coffee that you might not know. Caffeinated coffee drinkers were less likely to develop Alzheimer's and Parkinson's disease. Content of antioxidants in coffee will prevent cell damage associated with Parkinson's. While the caffeine will inhibit inflammation in the brain, which is often associated with Alzheimer's disease. Coffee contains caffeine has antibacterial and non-stick so it can keep the bacteria that cause tooth layer gnawing holes. Drinking a cup of coffee every day proved to prevent the risk of oral cancer by half. This compound is found in coffee also may limit the growth of cancer cells and damage DNA. By menopause, women who consume 4 (four) cups of coffee a day had a reduced risk of breast cancer by 38 percent, according to a study published in The Journal of Nutrition. Coffee releasing phytoestrogens and flavonoids that can withstand the growth of tumors. However, consumption of less than 4 (four) cups will not get this benefit. Prevent gallstones. Gallstones grow when the gall bladder mucus in the trap of crystals - crystals of cholesterol. Xanthine, which is found in caffeine, will reduce the risk of mucus and storage. Two cups of coffee or more every day will help this process. Consumption of 2-5 cups of coffee every day could help lower the risk of nonmelanoma skin cancer by 17 percent. Caffeine can stimulate the skin to kill cells - pre-cancerous cells, and also stop the growth of tumors. People who consume 3-4 cups of regular coffee or decaffeinated coffee (with caffeine content minus) will reduce the risk of type II diabetes by 30 percent.